This year I ventured up to Dayton Hamvention and had my sights set on getting a new radio. I was able to purchase a Connect Systems CS800D dual band FM/DMR radio. I naturally removed the cover to get a peak under the hood as seen in the photo above. Once I was done understanding the basic layout of the PCB (note the UHF PA mounted to the back of the case, top of the image, and VHF PA at the front of the case, bottom of the image). I found it interesting how they fit so much radio into such a tiny package. After some bench testing, I decided it was time to figure out how to mount it in my car. With a remote control head, I can simply mount it with the same setup as my Yaesu 7900R control head (which has since been sold). One problem, the remote control head mounter supplied with the radio does not match the mounting plate I have in my car. To fix this, I need to create a new mounting plate (or at least an interface plate). I started up Autodesk Inventor. Follow me after the break for more details or check out the part on Thingiverse! Tonight at 7:30 PM EDT, I will be giving a presentation on Amateur Radio at the University of Florida. The event will be live streamed via the YouTube link above. If you are interested in making with electronics, getting your amateur radio license can open up a whole new world of opportunities. Come learn a little about the original makers and the various aspects of this exciting hobby! UPDATE: I was asked to share some of the links in a clickable form. Check out the links below! Remember you can use Amazon Smile to donate to the Gator Amateur Radio Club! Just search for “Alumni and Friends of Gator Amateur Radio”. This week I want to share a video of a presentation I made back in July on Digital Mobile Radio or DMR. DMR is a cool technology for commercial and amateur radio. It uses TDMA technology to enable two independent conversations on one frenquency at any given moment. Check out the video above for an overview of multiple digital voice options in amateur radio, as well as some in-depth discussion on DMR. Sorry the lighting on me is dim in the video. It was lowered to help the contrast for people attending live. If you enjoyed this video, I will be hosting a live Introduction to Amateur Radio next week on Thursday! Stay tuned for more details and links to the live stream in a bonus blog post next week! This past summer my brother and I ventured to the Bahamas for a short vacation. As amateur radio operators, we thought it might be fun to work from a different country. Several weeks before our trip, we received our reciprocal licenses from the Bahamas. Assigned the suffix “/C6A”, it was then time to figure out my rig. Traveling with a radio is hard. Antennas for HF typically require lots of area, and people ask lots of questions.I wanted to have a small radio that I could operate from the beach. My brother brought his Elecraft KX2, but my Icom 706MKII would be too bulky. Follow me after the break to learn more about my solution. I was working on my Icom 706MKII a little while ago. I had gotten a new Heil mic for my rig earlier this summer and needed to tweak the ALC on the radio. When I was telling my brother, Tony (KD8RTT), about it, he asked me to make a video to help viewers of his channel. Check out the video above if you’re having mic issues with your Icom 706! I know I have been bad at posting projects recently, but here is one I have done a few times now that is super easy to reproduce. With the super cheap embedded Linux platforms (Raspi, Beaglebone, etc.) and cheap TV dongles, it is really easy to make your own APRS iGate, just like the one in the photo above. This tutorial will give you the steps to get going with an APRS iGate. What is APRS you ask? APRS stands for Automatic Packet Reporting System. It is a 1200 baud RF (mainly ham radio) packet system commonly used to record telemetry. Sometimes it is fun to log a trip or track a robot. APRS is a great tool for these sorts of problems. 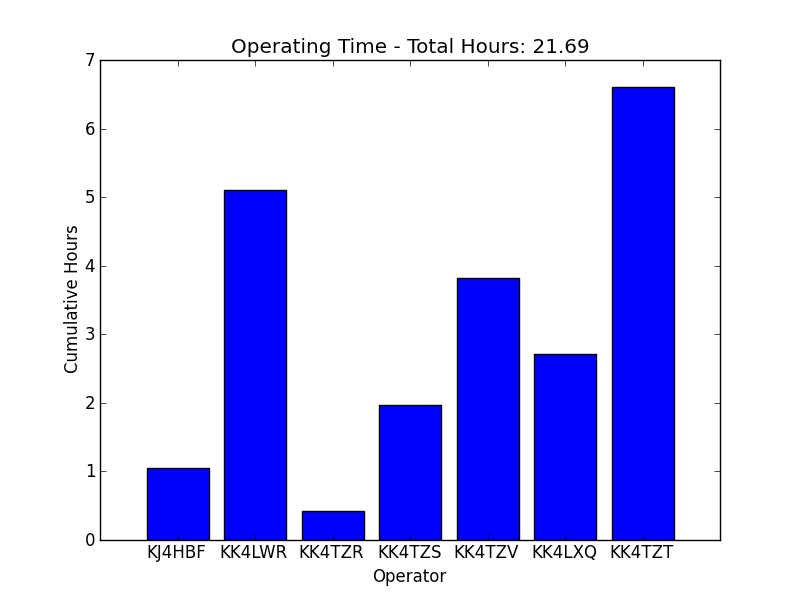 In the USA, APRS is commonly used on 144.39 MHz. It can be used between radios directly or can be used to log on the internet (via websites such as APRS.fi) via an internet gateway or iGate. Well CQ World Wide DX SSB contest is going on this weekend, but I have been chugging away at completing the logs and uploading videos. The video above is Kishore working a contact. Below you can see Yang and Akshay working as well. We had a very successful School Club Roundup this year. Below are some of our operating stations. The first graph is total time operating. 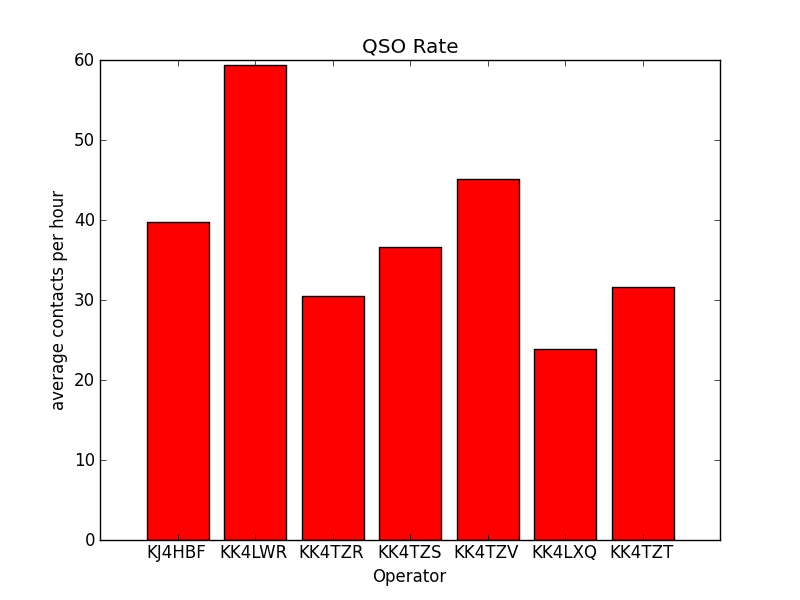 The second graph is contacts (QSOs) per hour. 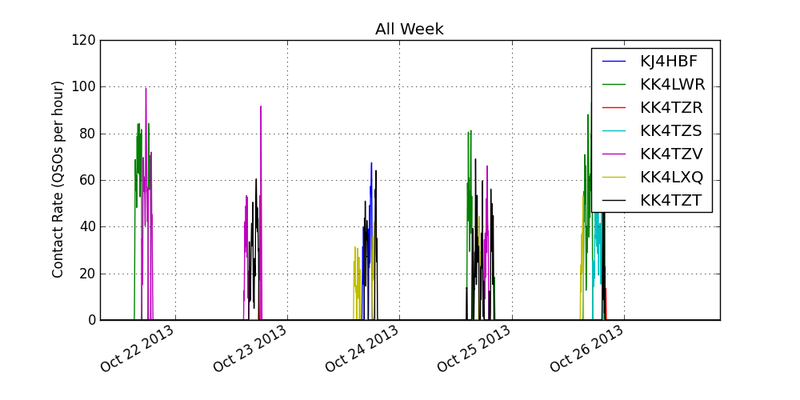 Finally the last graph shows our activity over the week. We had a total of 905 QSOs to people in 89 different locations (US States, Canadian Providences, or Countries) of which 5 were clubs and 38 identified as schools. It was a very successful week and a lot of club members got on the air for the first time! I am working on getting a few videos done from the Orlando Mini Maker Faire, but this week another event has my attention. This week is the American Radio Relay League‘s School Club Roundup. The School Club Roundup (SCR) brings the focus to elementary, middle, and high schools plus colleges and universities. The event begins on October 21st (yesterday) and runs until Friday. This is my 3rd SCR operating from the University of Florida. 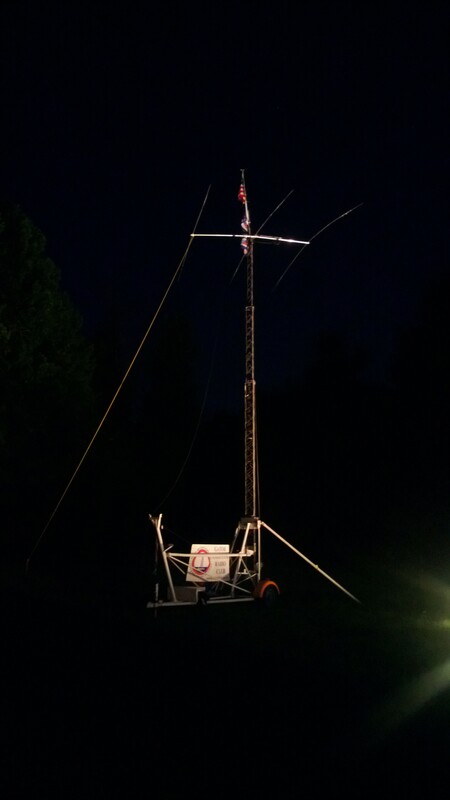 Our club station is W4DFU and we are the Gator Amateur Radio Club. Last year we came in 1st place in the College/University category in the fall and we came in 3rd place in the College/University category for the spring. We are already out in full force. Check out the video above of us operating yesterday. We have over 200 QSOs! We plan on operating every day this week between 1400 and 1900 EDT from our club station, atop the dental school here at UF. Feel free to give us a shout! We would love to get you in the log! Best of 73s and Good DX! 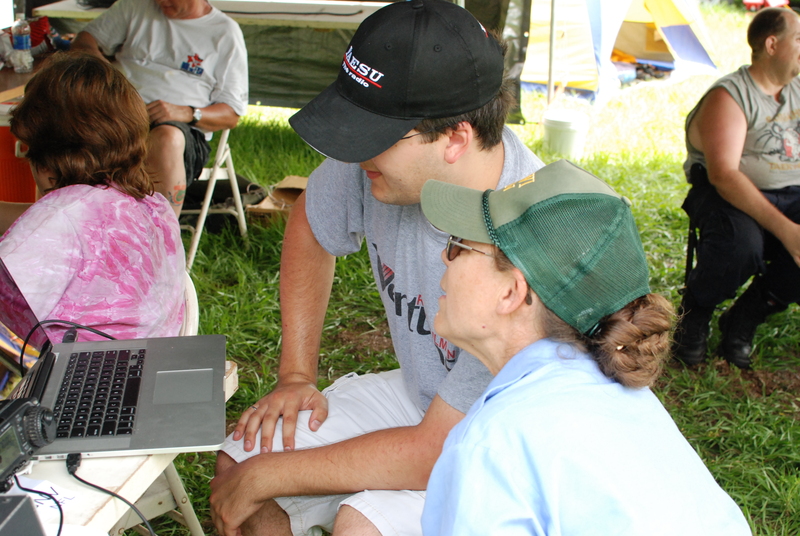 This past weekend was the 2013 ARRL Field Day. 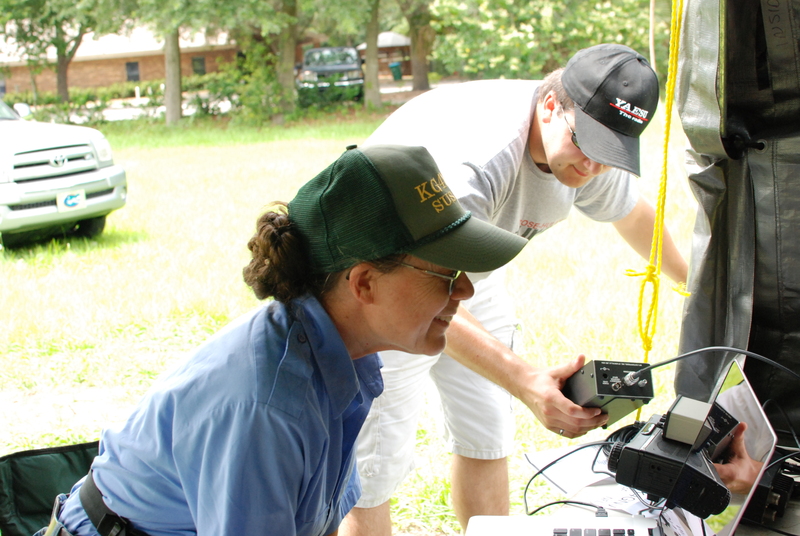 Field Day encourages amateur radio operators worldwide to get on the air using alternate power or different locations to test emergency preparedness. Both me and my brother Tony were on the air with our local clubs. 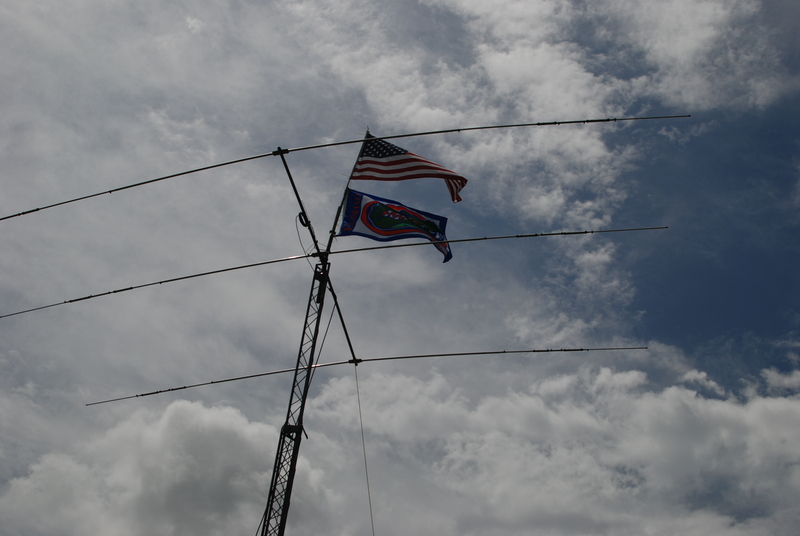 The Gator Amateur Radio Club (GARC) teamed up with the Gainesville Amateur Radio Society (GARS) for Field Day here in Florida. Tony worked Field Day from Ohio. In addition to using the club radios and antennas, I also tested out my MagLoop and Icom 706MKII. I worked 2 contacts on digital with just 40 watts. Considering I was hoping to use it with QRP power levels (less than 10 watts), I was quite pleased to get 40 watts out of it. It could probably go higher, but I do not want to arch across my capacitor. Below are a few pics from our setup in Florida and of the loop in action. Enjoy! The loop was easy to tune with the help of the MFJ antenna analyzer. I need to improve my ability to tune based on sound, although it is pretty to get it close. It was just outside the tent (you can kind of see some of the copper in the picture). We were all impressed with the low noise and excellent performance of the loop antenna. It got quite a bit of attention from both club members and the general public. The American and Gator flags flying high above our beam! Go Gators! 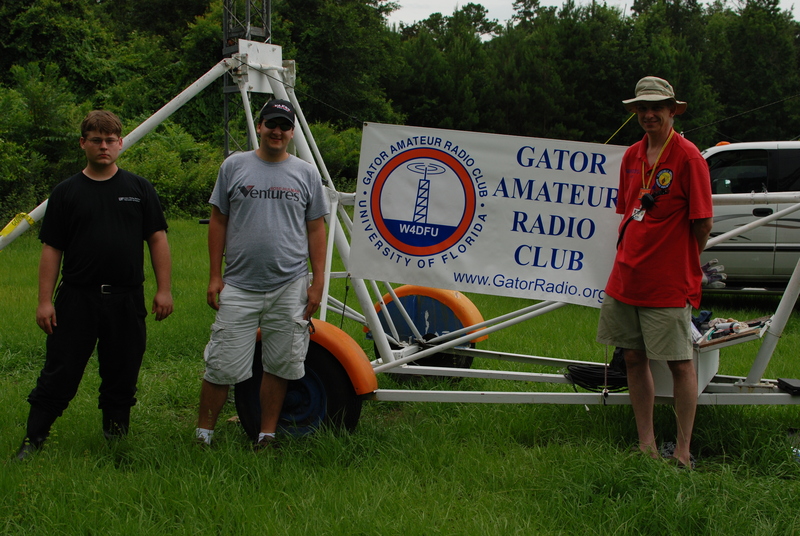 The members of the Gator Amateur Radio Club at Field Day: (from left to right) Ronnie, Andy, Jeff, and Sam (taking the picture). 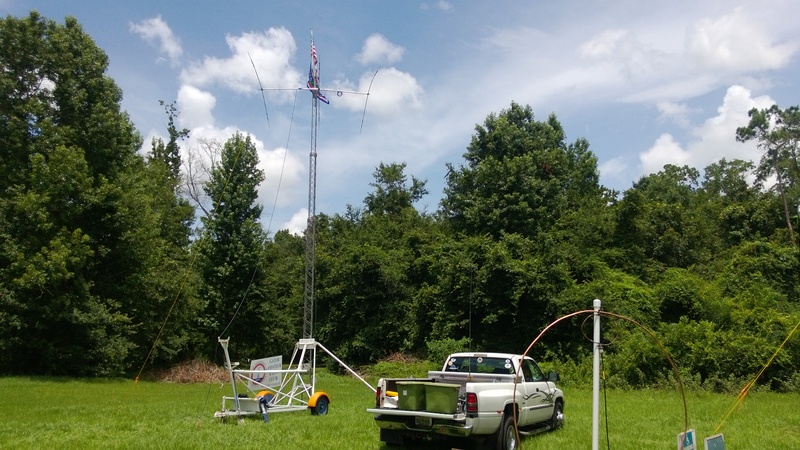 W4DFU Tower and my loop in the foreground. 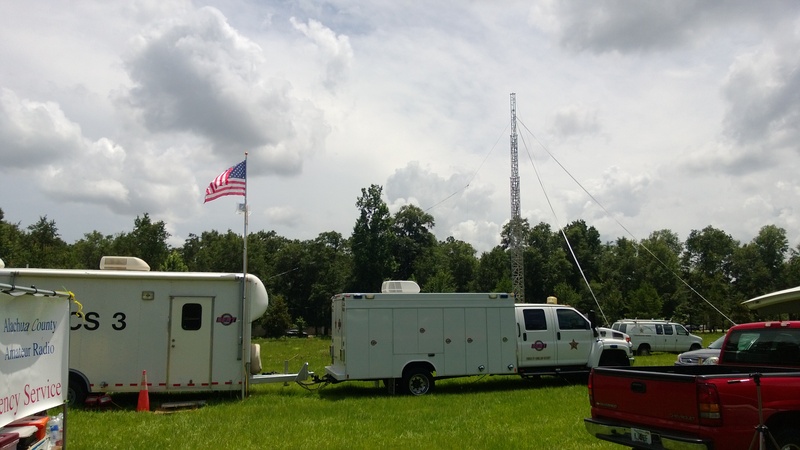 Florida State EDICS Trailer and Tower in the background. At night, the towers were up lit and looked really cool! So the Magloop I posted about earlier was hard to tune. The problem? I cannot turn the dial in small enough increments. After some discussion on the MagLoop email chain, it was suggested I gear it down by about 50. Now Field Day is less than 24 hours from now and I am short on supplies. However, as many of my readers know, I do a lot with LEGO, from Robots to large scale models. I had a few gears on hand and made a 48:1 gearbox. 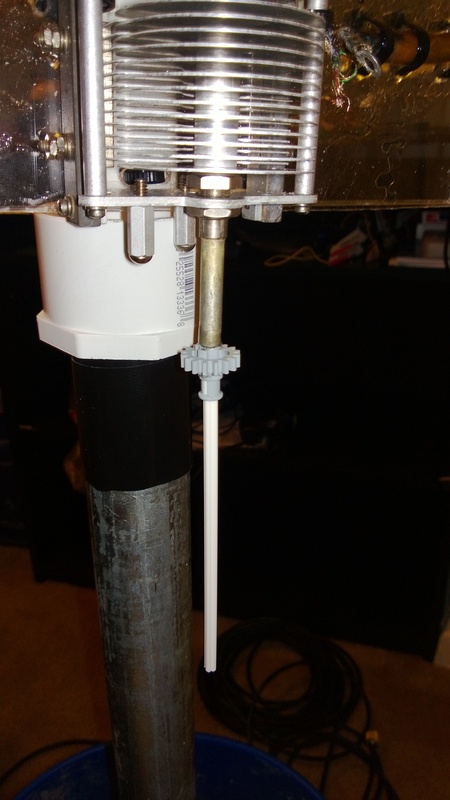 To get started I attached an axle (along with a gear for stability) to the shaft of the air variable capacitor. I did this simply with 5 minute epoxy. I added some more after it dried so it would be stronger. The next step was to mount the gearbox. I removed the 48 tooth gear. To keep it flexible, I only attached one of the frames (the top one in the picture below) to the air variable capacitor. 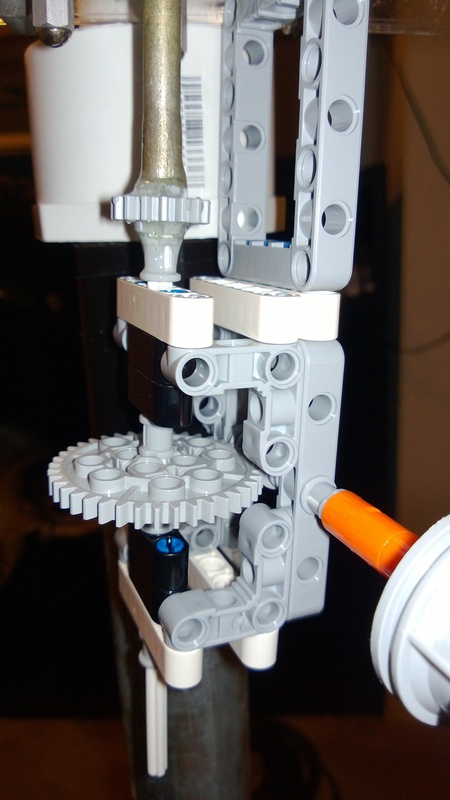 The rest of the gearbox is held together the same way as any other LEGO Technic model. I took off the bottom part of the gearbox and slipped on the 48 tooth gear. Note that the handle seen in the picture below is attached to a worm gear. The picture below shows the completed gearbox assembly. It does add some overall length to the assembly, but I was able to tune up just fine. There is some slip in the gear-train, but the steps are so small that it doesn’t appear to be an issue. Below is a close up of the gearbox. It turned out really well and I can’t wait to be on the air tomorrow with my new, functional, easy-to-use MagLoop! 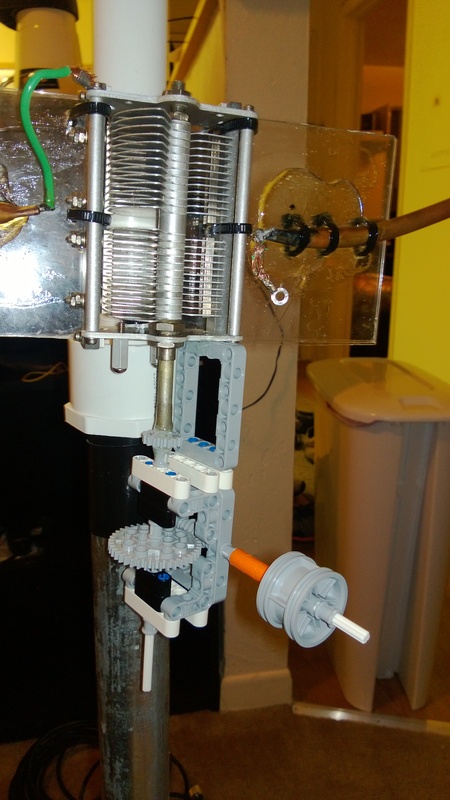 This very well might be the first time LEGO products have ventured into amateur radio. Following Field Day, I am going to expand the system to include an EV3. 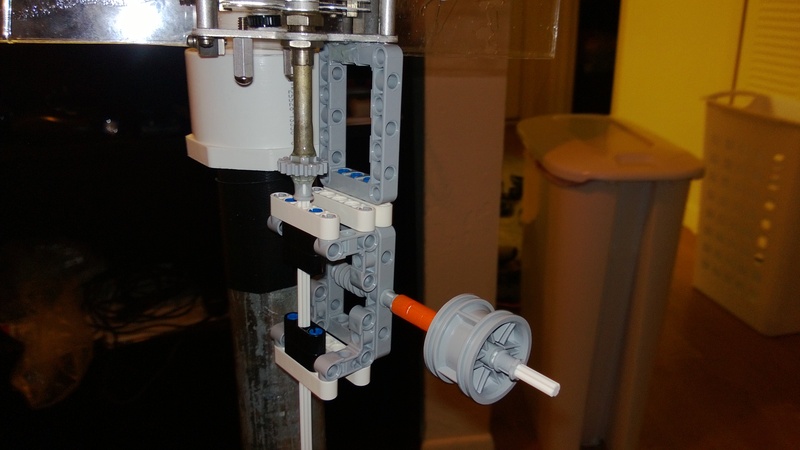 This would allow for even better accuracy using the encoded motors, attached to the gearbox.